This has been my task today. I really can't say there's much of a sermonette or even a worthy thought for the day in there, but when you have an office as chock-a-block full of paper as I do, there comes a time when you just have to bite the bullet and -- shred it! I'm trying very hard not to spend too much time looking at these pieces of paper that I'm tossing in the shredding box. My guiding principle is this: if I haven't looked at this in weeks, or months, or years, then chances are it's out of date or really wasn't worth keeping in the first place. I confess to glancing briefly at a few workshops I've designed, class papers I've written, discussion questions I've compiled and remembering fondly the first (or last) time I used them. But I also know very well that folks offering workshops or doing research or preparing for discussions also deserve the fun they'll have inventing their own, and don't need my help. I did only a cursory glance at the conference bulletins, orders of service for a few special occasions. I peeked briefly at the pictures in some of the old newsletters, Heralds, and graduation programs I discovered. I'm feeling a real sense of accomplishment as I move some things that have been mine into a nice orderly and documented stack of things that will become someone else's very soon. It's especially good to know who those folks are and to feel confident that they'll do just a fine job carrying that responsibility into the future. Now this is beginning to sound like a major "Farewell Address" and it isn't quite that yet. 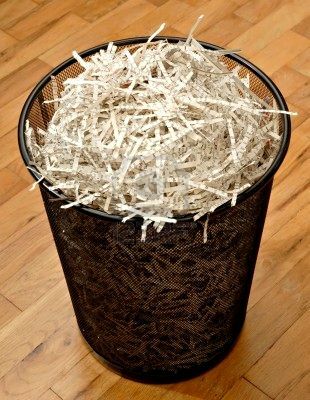 But today has been "Shredding Day" so this is what you get. May I also say that I'm very much looking forward to creating some more papers, stories, poems, letters, journal entries, essays, etc. for some future time. I am not through with accumulating or with creating just yet. And I have too much fondness for the blank page to give it all up any time soon. Now, back to the files! shred away! casting off the old can be good as long as you are making way and making room for the new!